Some intriguing titles are coming to Blu-ray and DVD today (July 4th a.k.a. Independence Day) -- including the award-winning The Zookeeper's Wife starring Jessica Chastain; Song to Song starring Ryan Gosling, the Canadian film Drone with Sean Bean and the thriller Awakening the Zodiac, about the deadliest killer in U.S. history. 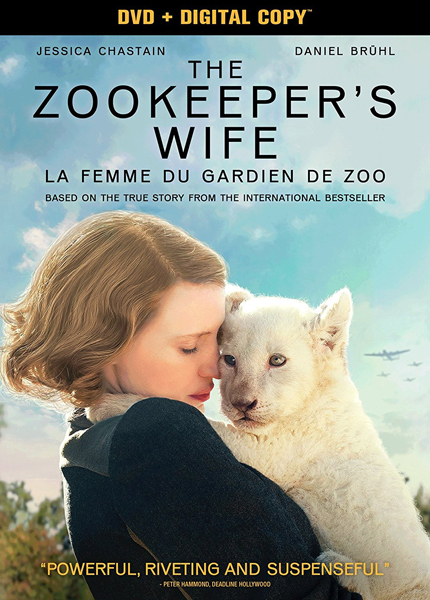 The Zookeeper's Wife - Antonina Żabińska (Jessica Chastain) and her husband, Jan Żabiński (Johan Heldenbergh), run the Warsaw Zoo, but when their country is invaded by the Nazis in 1939, they're forced to report to the Reich's newly appointed chief zoologist, Lutz Heck (Daniel Brühl). The Żabińskis secretly begin working with the Resistance to save the lives of Jewish escapees, hiding them within the zoo, putting their own lives and those of their children at risk. Song to Song - The lives of two couples — struggling songwriters Faye (Rooney Mara) and BV (Ryan Gosling), and music mogul Cook (Michael Fassbender) and a waitress (Natalie Portman) with whom he becomes involved — are intertwined as they strive for success on the music scene in Austin, Texas. Awakening the Zodiac - In 1968, one of the deadliest serial killers in U.S. history disappeared without a trace. His identity and cryptic messages remained unsolved for decades. When a couple (Shane West, Leslie Bibb) uncover a 40-year-old film reel depicting two gruesome murders taken by the killer himself, they set out to solve the mystery and claim the $100,000 reward. Little do they realize that they're putting themselves in grave danger. Drone - Neil (Sean Bean) operates military drones tasked with carrying out airstrikes in wars overseas. As Neil sits at his desk, the lives of others are literally in his hands as he gives the commands to strike. But his life and the life of his family will now be in the hands of a mysterious man named Imir seeking revenge against the man who took the lives of his family, who were innocent casualties of a previous airstrike.